Before you start this journey it’s imperative that you understand how big this decision is. Your disability, even if it’s invisible, will become more visible. Having an assistance dog is like a neon sign saying you have a disability. If you have social anxieties this will be something you need to really think about before making this decision. Are your specialists on board with this? Are you family and friends supportive? What tasks will you need? What breed is best for those tasks? 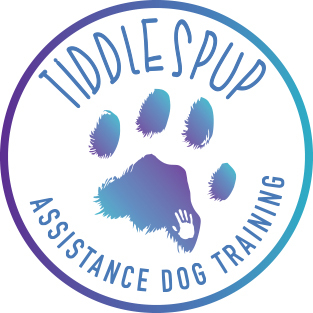 Do you want assistance with training your own dog? Or better suited to receiving a program trained dog? Keep in mind that it takes 12-24 months on average to train an assistance dog to standard. This is not a quick process. Do you have the financial means to support a dog, and the training? Our training estimate is $5000, it may be more or less, depending on the level of support needed. Aside from training costs, an assistance dog must have the best care; vet, pest treatments, vaccines, high range foods etc. Once you’ve made the decision, you can start preparations. Make lists of tasks, breeds, breeders and organizations, and local trainers. Research, research and research some more. Choosing a breed, a breeder and a trainer all require asking lots of questions. These are huge parts of the journey, choosing the right trainer is a long term commitment, you’ll be working together for the foreseeable future and you need to develop a working relationship with them, if you don’t click, it won’t work for you, your dog or the trainer. Add to the fun and come up with a list of names for your pup! Once you’ve got all that worked out the wait starts. While waiting for your pup from your carefully chosen breeder you can begin researching gear and training. Most trainers will have their own list of gear they use and recommend, and training plans, videos etc. that they can point you to also do check in with them first so you are getting the right information the first time- this saves retraining in the future. What should you get ready? Printables: Training commands- verbals and nonverbal signals (please email for copy of this document), Dog behaviour cues and body language, first aid desensitization and socialization Checklist , Safe and unsafe foods.